About the Lighthouse and visitors center: First built in 1859 but promptly destroyed by Civil War Confederate troops in 1862, who thought the Union troops might try to use it an observation post. Rebuilt and completed in 1873. Electrified light in 1932. You cannot climb inside the lighthouse, but we took the nice photo above. You can get nice clean shots of it from a couple angles. I am not sure, but there may be a restroom and a water fountain inside the visitor center, but there are no food or drinks on the premises. Recommendations: Nothing special needed here; There's nothing to do here except look and maybe pick up a postcard and snap a photo. However, it's quite a way from a gas station, so make sure you have a fill up before getting here and continuing on. You'd need at least a quarter tank at minimum. Water and a camera is all I suggest; you cannot climb the lighthouse. 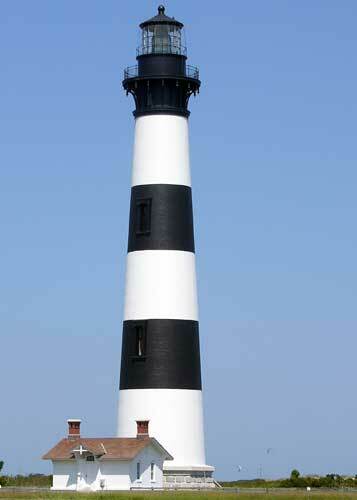 The lighthouse is not located in a specific city or town; it's not far from Cape Hatteras, but is located on a stretch of highway that runs along the National Seashore. Cost: is free for everyone; donation box in the visitors center to contribute if you'd like. Hours: 9am-6pm in the summer and 9am-5pm After Labor Day. Open year round. Food/Beverages: NONE available; may be a water fountain in the visitors center. Address: The park is located eight miles south of the US 158 and US 64 intersection, west of NC 12.